7 Apr : Govt may have to reconsider its policy of not using air force in the fight against Naxalites, Home Minister P Chidambaram said on Wednesday since the Naxals massacred 75 CRPF personnel in the jungles of Dantewada district in Chattisgarh. Maintaining that a “war” has been thrust on the government by the Maoists, Chidambaram told a press conference in Jagdalpur there was no proposal to use army in the fight against Naxals. But replying to another question he said at present there was no mandate to use the air force or any aircraft. “There should be no knee-jerk reactions. It is a long- drawn struggle. We should remain calm and hold our nerves,” he said, recalling that Andhra Pradesh had achieved significant success in virtually eliminating the Maoists in the state. The Minister said his government still believed that the state police backed by central paramilitary forces were sufficient to counter the Maoist threat. “There is no proposal to use army. We think the state police assisted by Central paramilitary forces are sufficient to overcome the Naxalite threat. It is our present assessment of the threat,” he said. However, answering another question, he said, “at present there is no mandate to use the Air Force or any aircraft. But, if necessary, we will have to revisit the mandate to make some changes”. In Ahmedabad, IAF Chief Air Chief Marshal P V Naik said the IAF will be ready to join the operations against the Naxals if a decision is taken by the Government. Naik however said he was not in favour of use of air power. 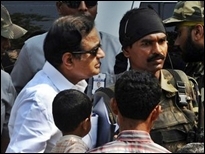 Asked about media description of Tuesday’s attack as war, Chidambaram said, “If this is war, and I wish to say that we have never used that word, it is a war that has been thrust upon the state by those who do not have a legitimate right to carry weapons or to kill. The State-the Central government and the affected state governments are discharging their constitutional and legal duty to protect the people,” he said at the press conference flanked by Chief Minister W Raman Singh. He said the state has a legitimate right to deploy its security forces to resist, apprehend, and, if necessary, neutralise militants who are determined to strike at the very roots of our nation.